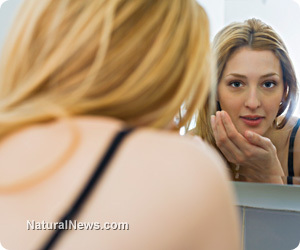 (NaturalNews) Blackheads are bumps (or 'plugs') on the skin that are caused by a buildup of excess oils and sebum in the skin glands. As these oils oxidize, they darken, giving blackheads their trademark color. Blackheads are extremely common, especially among adolescents. Though not a health concern, they are unsightly and difficult to remove, even when using expensive cosmetic products. Fortunately, the average household is filled with natural remedies for blackheads that are far cheaper, and often much more effective, than their pharmaceutical equivalents. Let's take a look at the best of them. Baking soda - Baking soda is often marketed in the cosmetics industry as a microdermabrasion product. However, regular baking soda is just as effective as the overpriced brand products you'd find in a drug store. To create a paste, mix one teaspoon of baking soda with two teaspoons of purified water. Next, apply to the affected area, massage thoroughly, then rinse. This will not only remove dead or damaged skin but also loosen away the dirt and oil that causes blackheads. Lemon juice - Lemon juice is used for a wide range of skin problems, including acne, acne scars and blackheads. There are two beneficial ways to use lemon juice. First, combine four drops of lemon juice with one tablespoon of sugar and rub on the affected area. This will aid in blackhead removal and also improve the overall look of your skin. Second, combine lemon with yogurt, honey and salt and apply to the affected area. This will act as an excellent prevention against blackheads as well as an effective moisturizer. Salt water - Although salt water is most often associated with home remedies for sore throats, it also works against spots. Salt water works by drying out any excess oil located on your skin. Use daily, and after continuous and consistent use, you'll notice a large decrease in your number of blackheads. Toothpaste - Toothpaste, combined with rubbing the area with a toothbrush, fights blackheads in two ways. Firstly, the toothpaste dries out any excess oil there may be on your skin. This helps prevent the future occurrence of spots of any kind. Secondly, rubbing the affected area with a toothbrush acts as exfoliation and is a great way to loosen existing blackheads and leave your skin feeling softer and smoother. Honey - Honey will not only hydrate and tighten your skin but will also effectively draw out blackheads when used as a mask. To make a mask, combine honey with cinnamon powder to form a paste. Apply the mask and leave on for a few hours (preferably overnight). Remove the mask and you'll see clearer, healthier skin. Raw egg - Though it may sound eccentric, nourishing the face with raw egg is an effective home remedy for many skin problems. Beat one to two egg whites mixed with one tablespoon of honey and apply to the affected area for 30 minutes. It will not only remove your blackheads but also leave your skin looking vibrant and healthy.